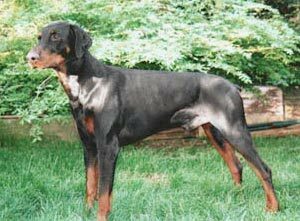 Apollo von der Urftquelle passed the Körung with Körklasse 2B rating and his litter-brother, Alfred von der Urftquelle, was the winner of the working IDC World Championship in 1999 with 286 points. His sire, Mannix von der Weyermühle, was a working police dog in the Düsseldorf area of Germany. Apollo's maternal grand-sire, Hertog Conan van Manensheide, passed the Körung 'for life' with highest rating for working drives and was the winner of the working IDC World Championship in 1993 with 285 points. Apollo's sire lived to 5 years of age (Mannix died from injuries sustained protecting his police handler in a riot) and his dam to 7 years of age.